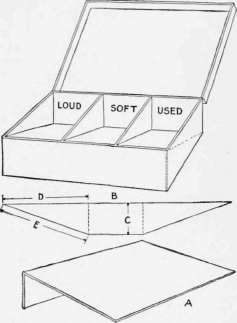 An empty cigarette box can be easily changed to a useful container for talking-machine needles, as shown in the sketch. Take a fairly heavy card, trim it to the same length as the box, then bend and crease it, as shown at A, and glue the short, upright side to the inside of the box. Cut another card to the shape B, so that the depth C equals the inside depth of the box, and the side D is as long as its width. The side E should equal the inclined length of the card A, and is glued upon it when B is in position. The three compartments may be suitably labeled as indicated. - Contributed by V. A. Rettich, New York, N. Y.